Fluorogistx receives the Aerospace Group Supplier Performance Award for excellence in serving Parker Aerospace. The awards were presented to the top 14 of 250 global suppliers that met Parker’s stringent criteria for continuous improvement in quality, cost, on-time delivery and supplier partnering. Debbie Edgar,Supply Chain Director for the Stratoflex Division in Fort Worth, TX.,was there to assist in making the presentation to Eric Long, Regional Sales Manager, representing Fluorogistx. Parker Aerospace, a Parker Hannifin Group, has $2 Billion in annual sales and more than 6,000 employees. 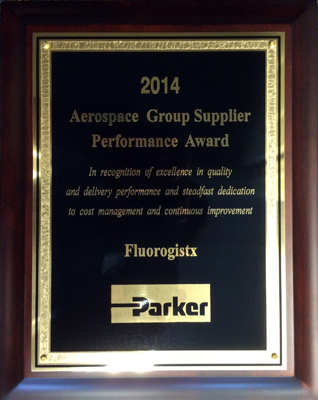 We proudly accept this award and thank Parker Aerospace for this important recognition.